During my first three years out of high school, I spent several months each winter living in a tent. One winter I did a solid three months, January-March with no days back in town. The tents, usually 14×16 feet in size, made up the camps from which we cut survey lines or did geophysics for mineral exploration. Since the camps were typically fly-in, with high costs for transporting gear, the weight and volume of our equipment was kept to a minimum. 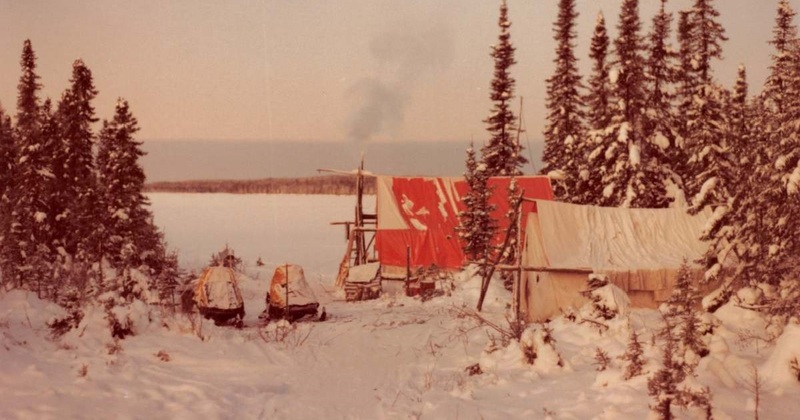 Heating came from an airtight, food was cooked with naphtha, and we commuted on Elans or snowshoes. Some of you will know what that all means. Lights went out at 9 p.m. and we woke just before 6 a.m. to the sound of whoever was assigned to restock the airtight with wood. I generally slept through the night but occasionally had to wander outside at 2 or 3 a.m. for a 30 below pee under the often spectacular northern lights. It’s one of the things I remember most vividly and miss the most about that season of life. Some of the best meals I’ve had were the frozen sandwiches warmed over a lunch fire. Occasionally two of us would be cutting nearby lines toward each other around noon and meet in the middle. If one of us was carrying a tea-pail (empty tin can with a wire hook) and some tea bags, the endless supply of hot tea beside a warm fire often meant an extended lunch and lower production for the day. Getting back to camp by 4 allowed a nap before dinner, which was at 6. Some reading or cribbage, maybe a listen to the news on a radio, if we had reception, and it would again be lights out. Thirty years later, a craving for the simplicity, satisfaction and joy of those days seems to be influencing more and more of my plans and decisions. Even though I can’t live in the tent, I hold onto the hope that I can once again live in that place.